Wanted to remind everyone to join Aaron and me, July 1, 3:00 PM EDT. All you have to do is click the image below. You can watch from here, or click the You Tube icon at the bottom and watch from You Tube. I had so much fun yesterday doing the webinars and talking about Corel Painter 2016. Before I post the videos below, I want to remind you that my class starts tomorrow, Aug 15, 2015. In class I cover all the stuff in the videos in much more detail and explore much more. I had one session yesterday morning and it was so much fun. My buddy Corel Painter Master Elite Tim Shelbourne was there and teased me without mercy. It was a hoot and all in good fun. I know you will enjoy it. Winifred Whitfield and Hilary French were there helping, too. Thank you so much my friends. I held the second session yesterday evening. Winifred was back helping manage questions. Thank you so much Winifred. Also attending was Corel Painter Master Elite Helen Yancy. I quickly made her an organizer allowing her to interact with Winifred and me. It is so much easier when I have someone to talk with while doing a demonstration. Helen, thank you so much for letting me impose on you. OK, now you have the two videos to watch. They are also on You Tube. Hey, have you discovered the link to get Corel Painter 2016 upgrade for $99.00 US. Here it is. OK, don’t forget to register for my class. OMGosh, the blog hits 1,000,000 views today. I cannot believe it. I know that is small numbers compared to a lot of blogs, but it is a big number to me. Thank you bunches and bunches for your support. I have loved doing the blog and meeting all of you. You can join either webinar during the session…just click the link. I love doing this style. It is pretty fast…just make a few quick strokes and let the water flow do the rest. And y’all know I love anything in a Sumi-e style. This last one is a work in progress. I need to get back to it. Images that take a while to do, tend to bore me and I stop working on them, but I like the way this one was going. Since I usually work in watercolor, I might try playing with oils and dry media in the Webinars. OK…hope some of you can make the webinar. I am so excited. Download your free trial copy of Painter 2016. A completely new Welcome Window. Corel added tutorials plus a few other surprises. New color schemes for your workspace. A new shift start that protects custom content, like brushes, custom palettes, etc. Enhanced layer blending, which allows blending to transparency without the white or black issues in earlier versions. ABR import…you can import Photoshop ABR dabs into Painter. Wow! New custom palette toolbox, which allows you to send a custom palette as a toolbox to your friends. The box includes brushes, papers, and flow maps, which will be automatically installed on your friend’s computer. New full-screen mode allows an immersive painting experience. Particle technology added to liquid inks. Love it! Particle technology added to watercolor. Love it! Impasto can be added to particle brushes. Amazing! New Dynamic Speckle particles…think tamed particle technology that can be used with any other brush method. New Dynamic Speckle bristles…think particles can work like bristles. One of my favorite new features. Audio Expression…what? Watch your brushes explode to the beat of your favorite music…what? Painter is more stable than ever. Painter is faster than ever. I am sure I have forgotten something, but those are the major features. BTW, I can’t test it myself, but others have and Painter 2016 works well with Windows 10. Weathered, Corel Painter 2016, watercolor particles, dynamic speckle bristles, and impasto particles. So much fun. As with earlier versions, I am offering a class exploring all new features in Corel Painter 2016. Registration for Registration Corel Painter 2016, starts today, Aug 10, 2015, at the Digital Art Academy. Class begins, Aug 15, 2015. I cover each new feature in-depth, but I did something different with this class. Because there is the new shift start and it is easier than ever to import workspaces from earlier versions, I started with a complete clean Painter 2016 and show you how to build or customize your Painter to use your work flow. Join the class and develop your Painter workspace and learn all about the new features in the process. It will be fun, I promise. Here is a teaser video showing a little bit about Dynamic Speckle Bristle brush technology. Download the free 30 day trial of Painter 2016. 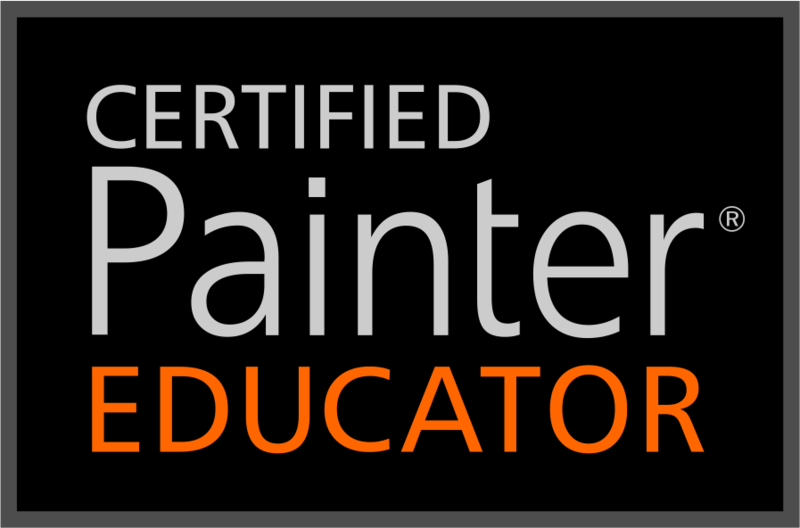 Registration for Corel Painter 2016 – New Horizons class. Class begins Aug 15, 2015.